Buettner identified five geographic areas where people live the longest. He named these areas “The Blue Zones,” and found that even though residents of these areas live in very different parts of the world, their diets and lifestyles have many things in common. If you want to add years to your life, and also life to your years, then this is information you need to pay attention to and apply in your life. Science tells us that most of us have the capacity to make it well into our 90’s, largely free from chronic disease. But life expectancy in the U.S. is only 78 years, and recently it’s been going down. Meanwhile, many of us fear aging because our elders often live in chronic pain and suffering. But the people in the Blue Zones show us that it doesn’t have to be this way. For many of them, it’s normal to live vibrant and full lives into their 90’s and beyond. In this inspiring 20-minute video, you’ll hear Dan Buettner debunk common myths about longevity. You’ll also learn where the Blue Zones are, what and how the people eat and live, and the most significant thing you can do to apply their principles in your life. A team of researchers and scientists worked together to search for evidence-based commonalities among all the places with the highest life expectancies. Move naturally. People in Blue Zones move throughout their day. They walk, grow gardens, and are active without thinking about it. Have a purpose. According to research, knowing your sense of purpose is worth up to 7 years of extra life expectancy. Finds ways to slow down and deal with stress. Everyone deals with stress, but people in Blue Zones have routine ways of dealing with it, including napping and getting together with friends. Eat less. The Okinawans have a saying to remind them to stop eating when they are 80% full. This 20% gap can make a difference between losing weight or gaining it. Eat plant-strong. The vast majority of the food eaten in Blue Zones is derived from plants. They eat what we would call “whole foods” rather than processed foods. Buettner says beans are a cornerstone of many of their diets. Have faith. Almost all centenarians interviewed belonged to some faith-based community. Put loved ones first. People in Blue Zones put their families first. They keep aging parent and grandparents nearby and invest in their children with time and love. Be social. Join or create social circles that support healthy behaviors. Want to learn how to implement these Blue Zone principles to improve your life? 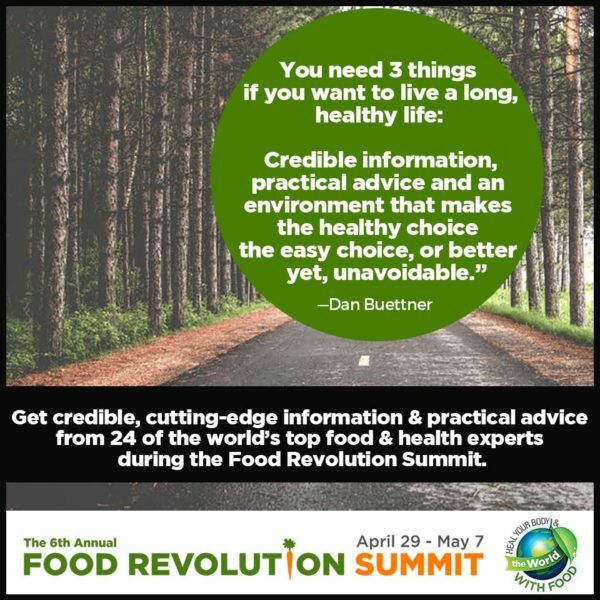 Dan Buettner is a speaker in the 2017 Food Revolution Summit. He and 23 of the world’s top food and health experts are sharing their latest, breaking insights about food, health, and the future of life on Earth. The Summit is Coming Soon! Learn More and Claim Your spot for this FREE, Online, Global Event by Clicking Here. Join the 2017 Food Revolution Summit Here. The Food Revolution Network is committed to healthy, sustainable, humane, and delicious food for all. Guided by John and Ocean Robbins, with more than 350,000 members and with the collaboration of many of the top food revolutionary leaders of our times, the Food Revolution Network aims to empower individuals, build community, and transform food systems to support healthy people and a healthy planet. If you’re inspired, share this article with your friends and family and your networks. Together, we can change the world for the better!